Do you want to increase the height of your basement? Do you want to increase the storage area of your home? If you are looking for ways to build a fully-functional basement that is cost-effective, Pour Concrete suggests bench-footing or benching technique. 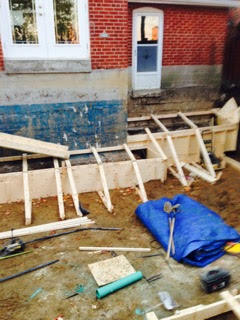 The GTA-based bench-footing contractor undertakes a simple and inexpensive process that includes installation of new foundation walls by excavating soil around the existing footing and creating a bench structure between wall and the floor. In this process, the existing footing and soil under it remain undisturbed. Is Bench-Footing Ideal for a Home? When you don’t want to spend money on expensive underpinning work. When you don’t want to disturb the original foundation work. When the foundation is not strong enough to sustain underpinning. When you want to lower your basement in the quickest possible way. When there is a common wall and the neighbor doesn’t consent you to dig under the foundation. Not every home can sustain a bench-footing project. So, it is important to understand the structure of your home and its foundation and footing. If bench-footing is done in a haphazard manner, it can cause harm to your house. Pour Concrete’s bench-footing team includes expert structural engineers who will understand the structural integrity of your home and suggest you with a suitable depth for bench-footing. Removing earth after benches are completed around the interior of the foundation. Pour Concrete takes extreme precaution in creating a strong bench-footing structure in your basement. Our team of workers is insured and expert in lowering your basement floor. All these things make us a trusted contractor for benching projects in and around Greater Toronto Area. Call us on 647-368-6206 or inquire online for a free estimate.